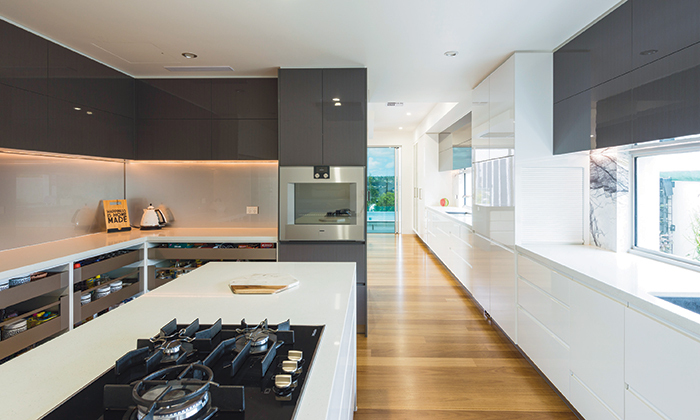 Creating an award-winning, ultra-modern kitchen was child’s play for Project Stone and Designer Kitchens, given the ample space they had to work with and their combined visionary flair for detailing. 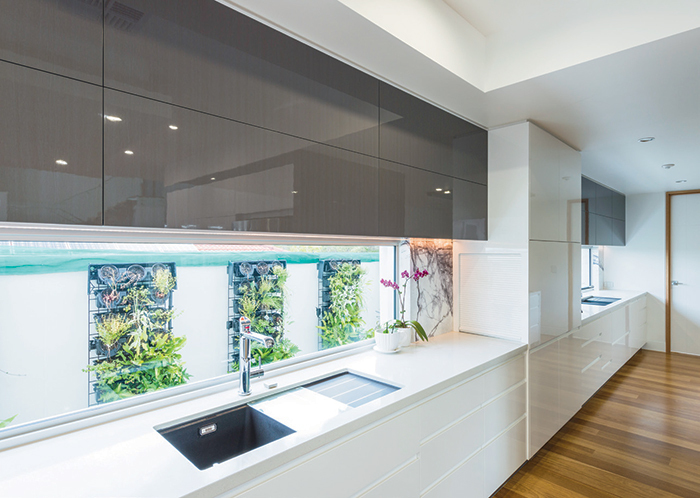 Featuring two interconnecting kitchens that flow seamlessly together, the space is versatile and very functional. A classic ‘show’ kitchen is visible from the living areas of the home, while a butler-style kitchen is more covertly positioned behind the main kitchen. 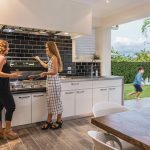 Having dual kitchens is perfect for creating a liveable space that can cater for family living as well as entertaining – as food can be prepared in the butler’s kitchen to keep mess and clutter out of sight with guests present. 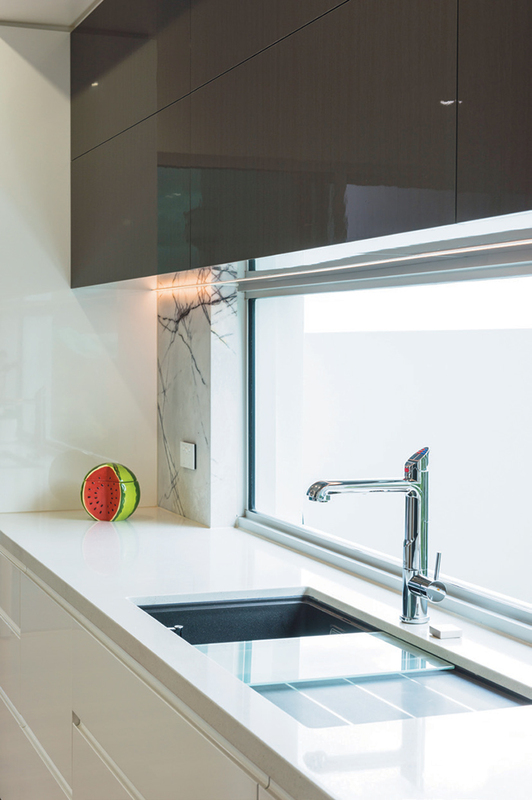 The defining feature of this new-build kitchen is the splashback made from beautiful NewYork marble supplied by Project Stone. 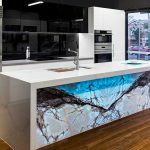 The marble theme is carried through the space, adorning both the splashback and the back of the island bench, to tie the look together. Lighting was integral in illuminating the marble in the back of the island bench to really help ‘set it off ’. 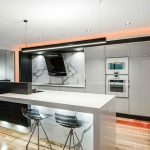 Creating your dream bathroom or kitchen is easy with our comprehensive directory of bathroom and kitchen designers and specialists. 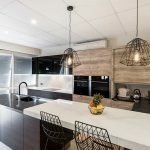 Other features of the stylish kitchen include solid timber flooring, reconstituted stone benchtops, and 2pac cabinets colour matched in Dulux vivid white gloss. Feature overhead cabinets made from Laminex’ Crystal Gloss in ‘New Graphite’ accentuate the space by adding colour contrast. 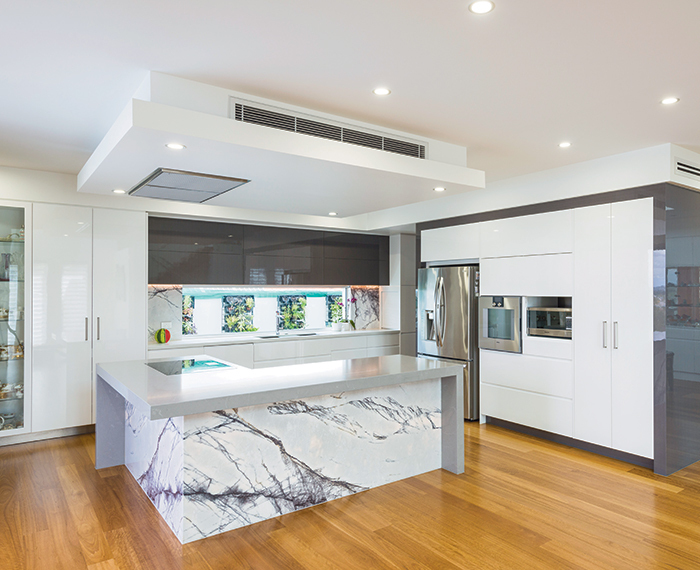 LED strip lighting was installed in the overhead cabinetry above benchtops to provide task lighting that aids food preparation and shows off the marble splashback.